I am much more fond of having all the cards that are available to you laid out in stacks at the beginning of the game, so you can have a plan at the start. The strategies begin when you start the game, not when you have learnt all the cards in the game that might show up (as you have to in Star Realms, for instance, to build a good deck). 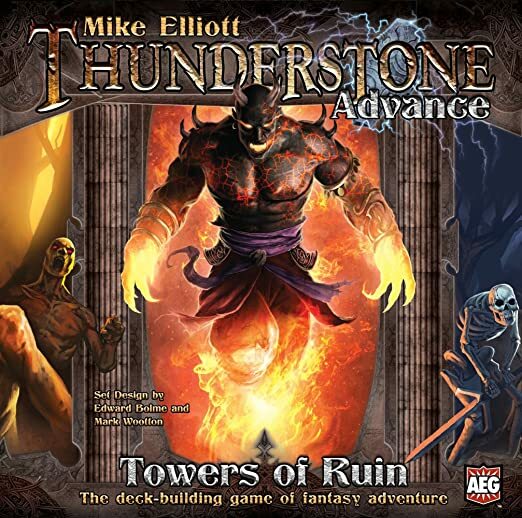 This element is the one I like the most when making the inevitable comparison between Thunderstone and it's closest family members, as far as I am aware, in the genre of thematic deckbuilding games, which are Legendary and Legendary Encounters. Thunderstone also works better thematically than either of those games. In the Legendary games, for instance, the cards you buy are variations of the famous characters, and so you may end up with several Iron Man or Ripley cards in your hand. As the Thunderstone cards are generic fantasy heroes though each card type shares the same artwork you can at least assume each card represents a different individual. Being able to level up those cards is a very satisfying action, as well as working with the D&D inspired theme, as unlike almost all other deck-building games you can add a more powerful card to you hand without actually having to increase the size of your deck. Legendary turned this style of game semi-cooperative, and Legendary Encounters had almost no excuse for competition between the players, and I think that largely accounts for why I enjoyed those games a little less than Thunderstone. Legendary Encounters did introduce some very clever, thematic rules to this style of game and I respect it, but comparing my deck to those of the three smart players I was pitched against is a lot more engaging to me that putting a deck up against a 63 x 88mm paper rectangle, even if it has a picture of the alien queen on it. Next time I'm remember that the hero stacks are limited and I can't do a dungeon run every time I have two longspears to rub together when someone else is stealing my next level tree peeps (I can't forgive you yet, Steve). I've not had a chance to play this yet but it looks interesting. How does it compare to Dominion (one of my favourites)?